New Yorkers march against repression in Philippines on Human Rights Day | Fight Back! 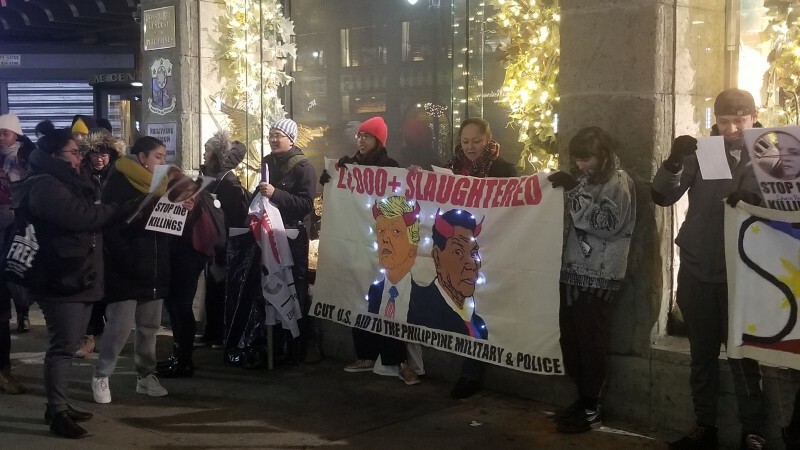 New York, NY - Around 60 New Yorkers gathered in front of the Consulate General of the Philippines, December 10, in Manhattan to mark the 70th anniversary of Human Rights Day. On this day in 1948 the United Nations General Assembly ratified the Universal Declaration of Human Rights (UDHR). The spirited group of protesters marched to Trump Towers after a round of speeches and singing, We Shall Overcome. They passed by the tourist-heavy Rockefeller Center and out-of-towners stopped ogling the giant Christmas tree to take pictures of the marchers. The evening ended with a speaker from ICHRP, who announced their new campaign to have the U.S. stop sending aid to Philippine military and police.